food, Restaurants - let's eat chic, Shopaholic abroad, Transport - planes, trains and automobiles, Travel - bon voyage!, Vive la France! I can’t say I really knew much about Normandy until recently. Admittedly, the closest I’d come to getting to know the place would be waving at it from moving vehicles or watching Band of Brothers. So how much Norman knowledge did my grey matter actually hold? Astonishingly little: Normandy is a place in France with English weather and lots and lots of apples. Has a coastline, ports and the Normandy Landing beaches. 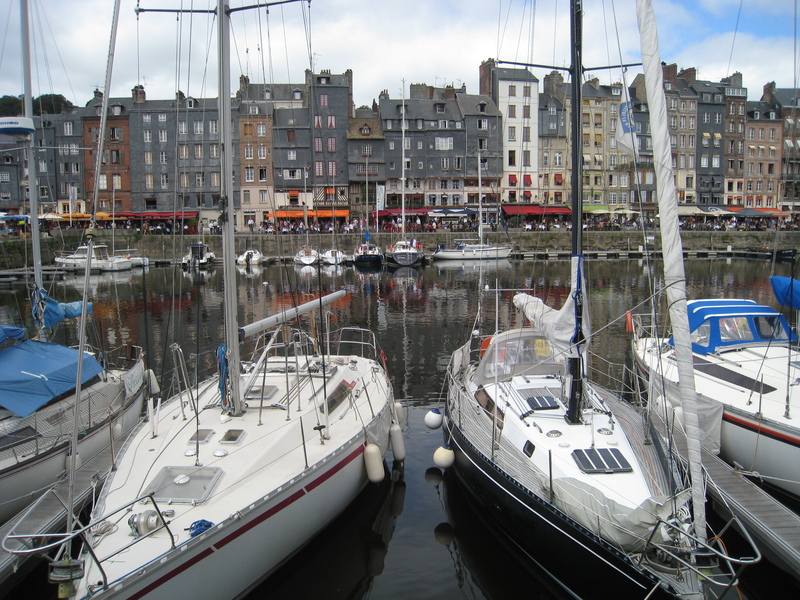 Can visit popular resort towns like Deauville and Trouville and Benerville-sur-Mer, only they’re not really on the sea at all; they’re on the English Channel. The Normans of the Norman Invasion came from Normandy. 1066. That’s why we have French words in the English language. Normans were originally ‘norsemen’ (as in vikings) who settled in the area of Normandy. I work with a guy called Norman, and Normans make good butter. So, you see? I knew a bit about Normandy but you could hardly call that knowledge encyclopaedic. This, dear people, has thankfully changed. Thanks to Monsieur and his family I have been put on a crash course about Normandy. Result? There is so much more to Normandy than war stories and Calvados. 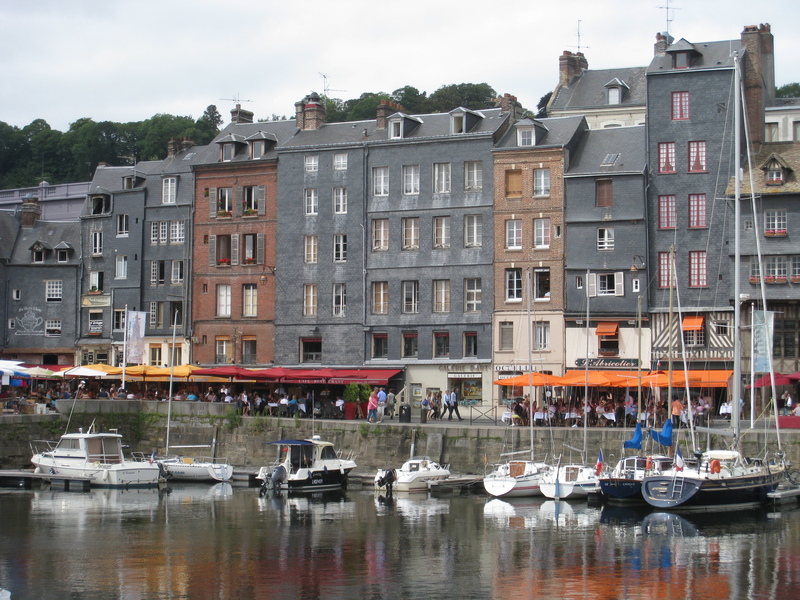 Take, for instance, the little town of Honfleur. A picturesque port with pretty rows of slate-fronted houses, this is the sort of place that makes you wonder if the Pied Piper of Hamlin is piping his merry song just around the corner. 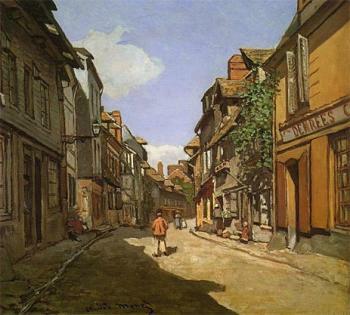 So pretty that it inspired works by impressionist greats like Monet, and, going by appearances, little about the town has changed since. The market stalls soon appeared, some selling nougat and toffee-encrusted nuts, others fresh fish and seafood. Half-timbered and slate-fronted houses lined up before us, their straight lines now crooked with age. Down a small street we found more stalls purveying every conceivable market ware – nautical clothes in navy, red and yellow next to baby clothes in ice blue and the palest pink, striped tees and souvenir aprons, home accessories, food-stuffs, wallets and shoes. Elsewhere we found leather belts and gingham-lined baguette bags, hammers and hardware items. Is there anything you can’t find at a good French market? Many of the shops had windows filled with bottles of cider and Calvados, pommeau (a cider-Calvados hybrid) and poiré (a pear liqueur). Souvenirs abounded, including little pottery bowls painted with popular French Christian names, tins of Norman biscuits and model lighthouse lamps. We pushed on, through Place Sainte Cathérine with the oldest wooden church in France, now barely visible thanks to the myriad market stalls and crush of Saturday shoppers, back to the inner port, where a flotilla of fine yachts rested in the Vieux Bassin. It will come as no surprise to some of you that Monsieur and I were now ready for lunch. We took a table at a restaurant terrace overlooking the Bassin. Named Le Pêle Mêle, it had a number of different prix fixe options at different price points. We decided on the Menu Étape where for a mere €13.90 a head, Monsieur and I could enjoy two fabulous courses of true Norman food. Monsieur enjoyed his starter of avocado filled with creamy little prawns. Simple, yet fresh and attractive in presentation but gone in a flash of famished Frenchman with fork. I had chosen moules (mussels) with cream, and not just any cream – NORMAN cream, of course. 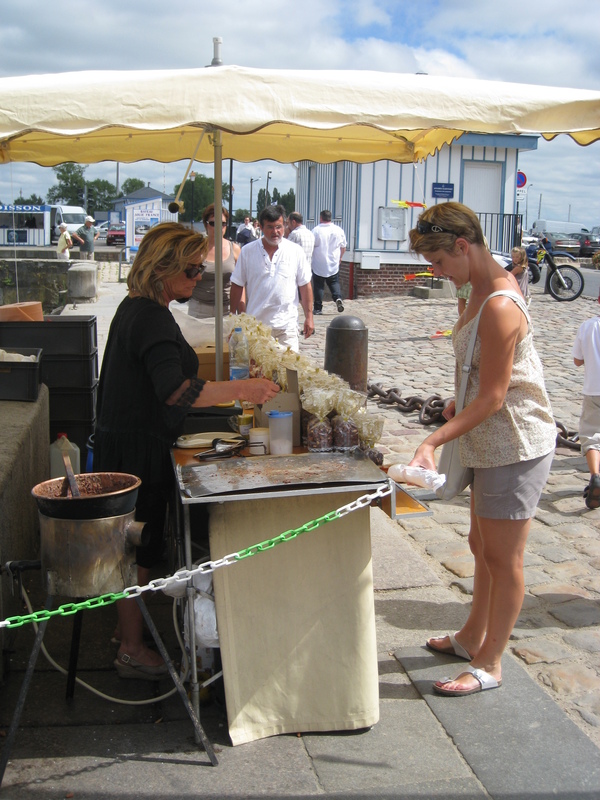 “Normandy’s known for its cream,” mumbled Monsieur between mouthfuls of crevettes. I could see why. The mussels had been simmered with onion and something vaguely apple-ish (cider, perhaps?) before arriving with a generous dollop of cream atop their black shells. 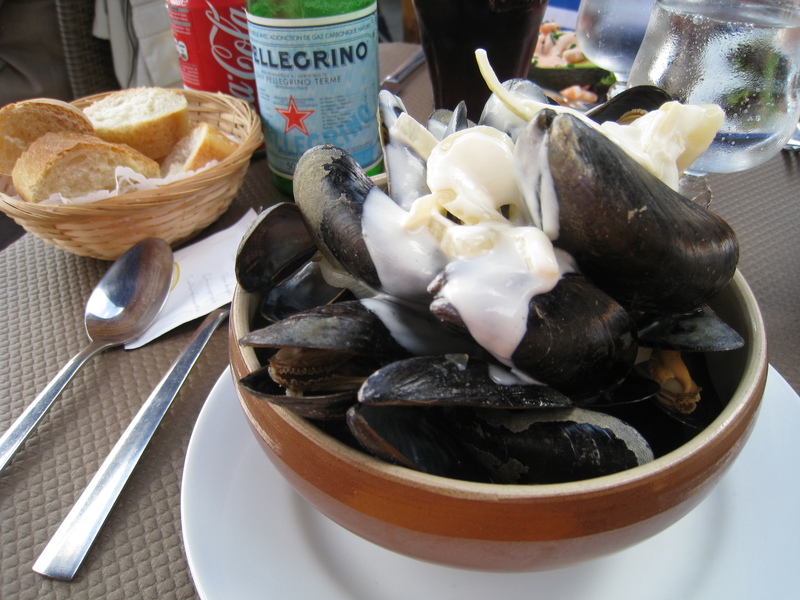 The cream melted into the mussel juice, making a delicious soup to slurp at the end of mussel-munching. When I was done, empty shells were all that remained. Next round? Entrecôte (steak) and frites for Monsieur. Dos de Colin (Hake fillet) with a cider sauce for moi. The steak was served with a peppercorn and (you guessed it!) cream sauce. The cider sauce also contained a fair udder or two of rich Norman cream, so this lunch was fast becoming a delicious yet high-cholesterol affair. Disappointingly, my hake looked quite anaemic on the plate, coated, as it was, with the pale cider sauce, yet on first bite I pronounced it one of the tastiest fish dishes I’d had the pleasure to eat in a long while. A lot of that was to do with the sauce – apple orchard and dairy farm blended on the palate. If only they’d do something to make the hake look a little less like hospital food, it’ll be flying out of Le Pêle Mêle faster than you can say BLOWFISH. Monsieur and I circumnavigated the Vieux Bassin on our way back to the Frogmobile, pausing to photograph the fairy-tale town and to stock up on Norman treats for family (we may or may not have also stopped for a naughty gelato at Amorino…). Back by the bridge the disturbing pair were still turning circles like a couple of bored dogs chasing their tails, the stocky man now hunching his shoulders like cousin Quasimodo. On we walked, back across the ancient planks, away from the crazies and the boats and the slate-fronted houses to the car. We had a long journey ahead of us, but fuelled up on Norman dairy and apple products, we were recharged and raring to go. Next stop: Brittany. Wow! look at all the tags on this post! I like local markets … unless they are local. Local markets in places that aren’t local are the best usually. PR, you strain my brain with your word games. Have wrung your comment dry – it’s like doing cerebral acrobatics. Phew. Local markets that aren’t local are better? Yes. I concur.